• Don’t fight or argue back with the customer, the first thing to do is calm them down, so just listen to them, let them vent a little. 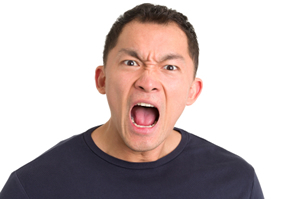 If you try to stop the venting, you may only exacerbate their anger. So breathe deeply and take the abuse. If the customer goes too far and starts calling you names, feel free to hang up on them. • Don’t take things personally, you're just a representative for the company that has failed to provide what the customer wants. The customer’s tirades are not aimed directly at you, but at your company. If you take things personally, you may get defensive, which is something you don’t want, the customer will just get angrier if you get defensive. • Don’t try to resolve a problem before you understand it. Get information from the customer to understand the impact the problem is having on the customer’s life. As an example, let’s say you’re dealing with a customer that purchased a spare part from you. He requested and paid for expedited shipping. Your company was unable to ship in time and, to make matters worse, it shipped the wrong part. As a result, the customer was unable to get his car repaired in time for a road trip he had planned. At this point, to promise a quick and correct shipment of the part won't repair the damage, because the customer cannot recover the lost time. In the worst of cases, his vacation came and went and he stayed put, because he didn’t have the option to reschedule his vacation or the money to rent a car for the trip. At this point, all you can do is to apologize in the name of your company and ask the customer directly what you can do to make things better. • Don’t send the customer away to some other rep or to your boss, as tempting as this may be. Rather, go out of your way to handle the situation yourself. Escalate when necessary and as dictated by your company’s customer service procedures. • Own the problem, put yourself in the angry customer’s shoes and handle the problem as if it was yours. This will have two effects: On one hand you will relate better to the angry customer, and on the other, you will do your best to get his/her problem resolved. • Solve the customer’s problem, quick and to the point. • Repair the damage. Many times, this is not possible because the damage may not be quantifiable, but do whatever you can within your authority (and company procedures) to make the customer whole. • Prevent the problem from happening again. Put in place measures to ensure that the problem doesn’t happen again to any customer. Or at least to this angry customer. Remember that customers are human, like you and like me, we all prefer to be treated respectfully by the companies we buy things from. Next time you face an angry customer, put yourself in their shoes and treat them like you would like to be treated. At this point, all you can do is to apologize in the name of your company and ask the customer directly what you can do to make things better. Yes you are right I think we should not try to resolve a problem before you understand it. Get information from the customer to understand the impact the problem is having on the customer’s life. I like your post! I can appreciate your blog, it is very enlightening. I think one of the things we should understand, is that anger is not necessary. Through my experiences, I believe anger is a misconstrued belief that one person or group can make another person or group listen to understand them (not possible). The more a person believes they have right to be understood, the angrier they get. The reason domestic violence presents with such a high degree of anger. When dealing with angry people, listen to understand them first,based on their personal understanding/s (All you can ever hope to control is your ability to understand others). When and if they feel you understand them, they will then be open to reciprocate your behavior in the absence of fear and understand you back. The most important thing to understand before dealing with angry people in business, is what you are able to do for them as outlined by your companies policies and why. I think sometimes being able to apologize and empathize and let the customer know you understand that they may not feel you are able to compensate them enough, may go a long way, but also communicate the reasoning behind the limitations placed on you to assist them. If they are still not satisfied, help them understand their options. Remember, you are not trying to make them agree with you, you are trying to keep them and their group which they may hold influence over as investor/s in your company.